Now before you go "ehhh, gross, spinach", give it a chance. They were actually pretty good. But serve them cold, not warm. They were nasty warm. Not so bad cold! Unroll crescent rolls; place in a 13x9 inch baking pan. Press over bottom and 1/2 in up sides of pan, sealing perforations. In a medium bowl, combine all remaining ingredients; mix until well blended. Pour into crust. Bake for 25 to 35 minutes or until filling is set. Cut into squares. And really, it was that easy. Then just refrigerate, and you have some tasty appetizers. But note that the kids would not eat them. It was more of a grown up snack. 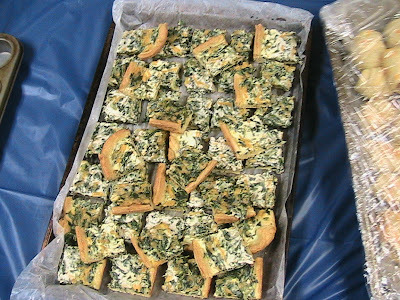 I love spinach dip..i have a really good recipe for it too. A lady at school made it..its spicy..SOOoooOO good! Ooooo, can you get it for me! Mine wasn't the best. Not bad, just not super good. Boil Spinach and hearts in 1 cup water for 10 min and drain. Microwave cream cheese until creamy and hot. Add parmesan cheese and stir. Add remaining ingrediants and serve with baguette bread. Yummy! Sounds super tasty. And I love the ones that are in the bread bowl. Super good!